The UN Conference on Environment and Development (UNCED) produced above all the beginning of a new process, rather than arriving at a singular and conclusive agreement to a specific problem – often the more common outcome of the negotiation. Whereas outwardly the UNCED process was familiar, it soon was to distinguish itself as a singularly instructive set of `regime-building' negotiations. 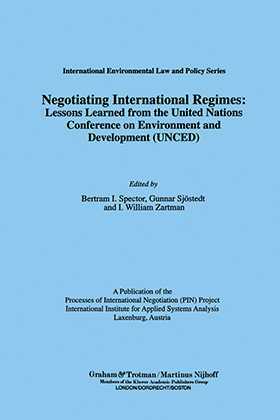 This important new work developed by the International Institute for Applied Systems Analysis explains and analyses the negotiation process of building international environmental regimes. Its value will be considerable as the international community faces the need to establish the variety of sub-regimes ( – desertification, biodiversity, forestry, and others –) spawned by UNCED. This work offers the conceptual and practical building blocks, as learned from UNCED, to all those engaged, and interested in the means to ensure sustainable development and the economic and environmental well-being of humanity. The text is accompanied by valuable appendices.